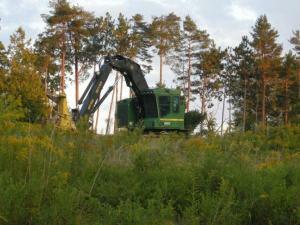 Habitat managers use different tools and techniques to make young forest and shrubland. 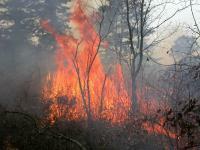 Controlled burning happens when trained specialists set fires that kill older vegetation, leading to dense regrowth of trees and shrubs. Native Americans used fire to renew different habitats and boost the populations of animals they hunted. Today conservationists use firebreaks, up-to-the-minute weather forecasts, and radios to keep fires under control and put habitat where it's needed. Herbicides get rid of exotic invasive shrubs in favor of native species that provide better food and cover for wildlife. Managers use short-lived herbicides and make sure they don't harm desirable plants or damage the environment. Planting shrubs or fast-growing trees can turn fields into great habitat in a few years. Help conservationists help wildlife by supporting land-management projects on both public and private land -- projects that create much-needed habitat for more than 65 embattled wildlife species in the Northeast today. Demonstration areas show what young-forest habitat looks like. For an introduction on how to make young forest, check out this Young Forest Guide published by the Wildlife Management Institute. Here's a link to a comprehensive technical manual, Managing Grasslands, Shrublands and Young Forests for Wildlife. Everyone from habitat novices to experienced land managers can benefit from reading this 148-page guidebook, published by the Northeast Upland Habitat Technical Committee. Want to create habitat on your own land? Contact your state wildlife agency, the U.S. Fish and Wildlife Service's Partners for Fish and Wildlife Program, the Natural Resources Conservation Service, or a certified forester. For projects that help wildlife, full or partial funding may be available.